The Gymchats are weekly discussions on a range of strength-training topics. Quite apart from being fascinating discussions in their own right, they're a lot of fun. Started back in Feb 2009 by Scott Bird, they were initially held on Twitter (and called 'Twitterchats'). In Aug 2011 they moved to Google+, and were renamed 'Gymchats'. In Sep 2012 we started doing video versions of the Gymchats, hosted by Personal Trainer 'Captain' Kirk Fontaine. These take the form of a Google+ Hangout, and are subsequently stored on Youtube for later viewing. In Sep 2013 Josh Hewett joined the team, co-hosting a number of Gymchats as well as helping to schedule future interviews and roundtables. If you'd like to appear on the show (either for a one-on-one interview or as part of a group discussion), just drop him a line. 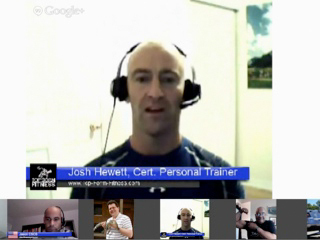 These discussions take the form of interviews with various fitness professionals. In addition to the questions asked by Kirk/Josh directly, everyone else on the Hangout is able to fire in their own on the topic being discussed. To find out the topic & URL each week, all you need to do grab the Strength & Fitness Newsletter (part of the Straight to the Bar Strength Kit), and you'll receive all the details. And as a bonus, you'll also receive tips on strength-training technique, unusual exercises and a whole lot more. As for taking part, well there are three ways (depending on whether you want to be on the show, or just watch). Here are the details. The topics are all aspects of strength-training, and change from week to week. Each gymchat is an hour-long discussion on a particular area. To get an idea of the types of topics we cover, head over to The Complete List of Gymchats. If it relates to strength training, we'll be talking about it. And if you'd like to suggest a topic for an upcoming discussion, or volunteer to be the 'interviewee' and answer random questions on the subject, just let us know. As well as Kirk & Josh, we invite everyone to host a show or two. To interview someone about their own workouts & competitions. It's wonderful to hear how everyone trains. If you'd like to offer your services as a Guest Host for the show, or suggest someone who you'd love to see interviewed about their training, let us know. Look forward to hearing from you.